Welcome to the second instalment of Grow Your Ethics – supply chain control and connectedness. In Part One I shared what led us to grow our ethics and detailed our farming system out on the paddocks. In this post I’ll outline the rationale for a short supply chain and direct sales and then show you what a typical fortnight looks like when you grow, butcher and deliver all your own meat. In modern conventional livestock farming, you raise the animals (pigs and poultry typically in sheds), and then take or ship them to the saleyards and hope for a decent price. That price is subject to market fluctuations based on whether there’s an over or under supply of animals and feed, and what processors and retailers are willing to pay to maintain their own share of the profit. We’ve managed to get our feed costs down to below $125 per grower (from $200 when they were on a diet entirely of custom-made commercial pig). That $125 includes the small ration of commercial grain and the motor vehicle costs of collecting the spent brewers’ grain and milk from other food waste streams. Based on saleyard prices, on a 55kg carcass, we might get $200. By the time you’ve accounted for labour, transport and general farm costs on top of feed, it’s really hard to make a living in that system. Of course you then understand the pathway into intensive industrial agriculture to achieve ‘economies of scale’ at the expense of animal welfare. So the obvious thing to do for a small farm like ours is to sell directly to eaters, but of course there’s still processing that must happen first. Abattoir costs in our region are cheap – just $37 per pig at ours. But butchering costs are not cheap – we were paying an average of $200 per carcass before we built our boning room on the farm. These financial realities, along with issues of reliability and the desire to work closely with our produce all the way to the eater are what led us to take on the butchering of all our meat. And what it’s meant to us goes far beyond control and profitability – it has deepened our knowledge of the animals out on the paddock because we understand what those working muscles end up like in the boning room. That in turn has extended my knowledge of the best ways to cut and cook different muscles. The butchery has also strengthened our relationships with our community of eaters as we discuss everything about the pork and beef they buy from us quite literally from paddock to plate, right down to the herbs I pluck out of the garden and use in our single-estate sausages. Last year we introduced our community-supported agriculture (CSA) model as well, which now has over 50 members. The CSA reduces my admin and logistics load and provides us with a known base income for the year, and develops even stronger relationships with our regular community of members. We love the feedback we get from our community – positive and critical – and they help spread the word about respecting the pigness of the pig. When we took over the butchery side of the business, I gained a much greater understanding of the actual labour input to the further processing, which has meant some changes to our pricing. I often say I’m basically a Marxist when it comes to pricing – I charge on the use value and actual input costs rather than what the market will bear. For example, belly from us costs $26/kg and a bone-in shoulder is $25/kg as the butchering is quick and simple for those cuts. A boned-out coppa roast (aka neck or scotch) is $30/kg, and bacon is $32/kg for a slab or $36/kg for sliced – slicing is very labour intensive! If you’re a chef, you’ll pay the same as everyone else. Our prices are based on what we need to charge to make a living, and dropping those prices would render us unviable. But we recommend that chefs buy whole or half beasts at $16/kg, or whole primals (shoulder/barrel) at $20/kg. See how it works? The less work we do, the less you pay. Eight pigs per fortnight are sent off and one steer per month. The pigs typically go to the abattoir on a Thursday and are back into our chiller on Friday. I pull the bellies off that afternoon and get them into salt for bacon. On Monday following, we (my Head Meat Grrl Jass, and our wonderful residents – currently Andrew and Theresa, and I) break down the shoulders and barrels into a set repertoire of cuts plus any custom orders. Tuesday morning we bone out the back legs for schnitzel, porko buco and our single-muscle hams (I do a brined & smoked noix de jambon), and the rest goes to sausage. Tuesday afternoon we make 40-60 kg of sausages, flavour dependent on the season (Mexican chorizo, Toulouse, sage & pepper, apple & sage, bratwurst…). Wednesday morning we slice and pack bacon, wrap hams, then sanitise the benches and pack sausages. That afternoon we pack orders – somewhere between 200 and 350kg of meat depending on whether it’s a regional or metropolitan fortnight. I send invoices that night after recording all the weights during packing. Thursday morning I load up the coolbox on the back of the ute and head off on deliveries – nine hubs around Melbourne one fortnight and five in the region the other. Friday I catch up on farm accounts and admin, and the following week I call my ‘non-cutting week’ even though we break down a side of beef on Thursday and pull those bellies off the next lot of pigs on the Friday… repeat ad infinitum. But the fortnightly schedule is amazing – it gives me the freedom for the writing and fair food advocacy work I do, now in my role as President of the Australian Food Sovereignty Alliance (AFSA). Stuart has completed construction on the commercial kitchen and curing room and we’re looking forward to having the facility inspected by Primesafe in a week’s time. 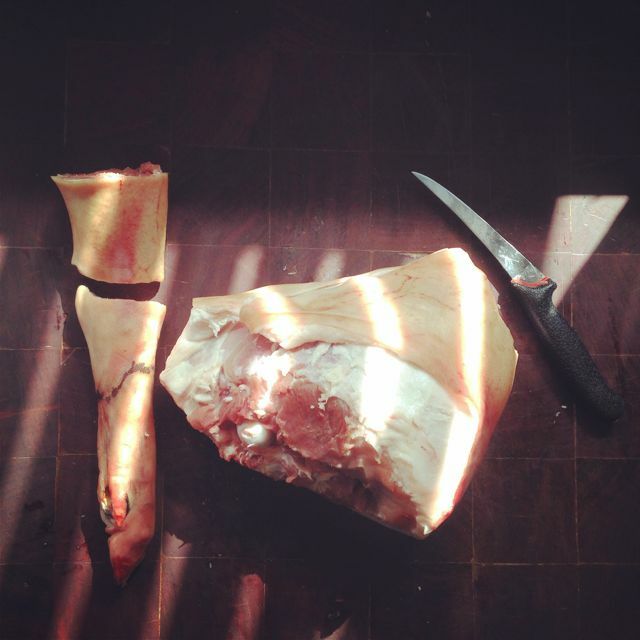 My fortnight will get a bit fuller with that addition as we transform every bit of the beasts into delicious nose-to-tail offerings such as bone stocks, pate de tete, lard, fricandeaux, and a range of single-muscle cures such as jamon, coppa, and guanciale. We’ll be submitting our process to the regulator to make farmstead salami within the next couple months as well, so watch this space! Supply chain control and direct sales make us viable, deeply, viscerally happy, and connected to our land, our animals, and our community. We are fully accountable for every step except slaughter, and we’re working with others in the region to hopefully solve that problem. In the next instalment of Grow Your Ethics, I’ll share how and why we avoid a growth and competitive mentality, how we manage the farm with fair labour, what radical transparency has meant to us over these past few years, and how all of these parts of our system come together to nourish us and our community while still respecting the pigness of the pig. In the interest of supporting Australia’s fair food movement and the other small livestock farmers who would like to move to on-farm processing, it’s time we gave you some more details about our budget and actuals on the project, and on how we went with our local council and the state regulator PrimeSafe. Rationale & Profitability Before I give you the nitty gritty I’d love to share the rationale and real financial benefit to our farm. Based on the final four months of having our meat butchered (Sept-Dec) and the first four of doing our own butchering on farm (Jan-Apr), our butchering direct costs went from 43% to 30% of total direct costs. More dramatically, it went from 22% to 11% of our total costs (including overheads). While running a coolroom & other associated infrastructure took our energy costs up some, it was in truth only a 3% increase (from 2-5%) in overheads, or a 2% (from 1-3%) in total costs. This change in costs came at the time we increased our supply from 5-7 pigs per month to 8-12 pigs per month (which would have increased our butchering costs a great deal), and introduced our CSA model (we now have 28 members!). We went immediately from making a loss on the farm (subsidised by my off-farm income, which I gave up in December with some trepidation…) to turning a profit. Huzzah! 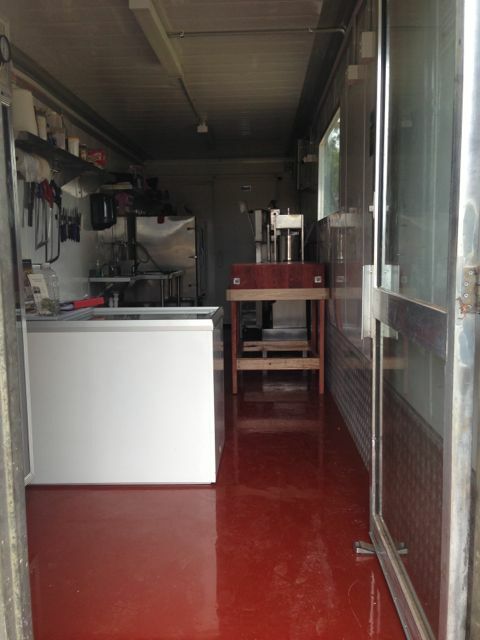 Construction In my earlier post on the meatsmith, I recounted the process we went through to build it from a 40-foot refrigerated container, so have a look at that for timelines, materials and construction challenges. Council We were initially informed we would need a planning permit, but due to changes to the planning scheme in Victoria 1 September 2014, that proved not to be the case for us. The new scheme allows for primary produce sales & rural industry without permits. Clearly if you have overlays on your property they could trigger the need for a planning permit, so you'd need to check those. So that just left us with PrimeSafe. Regulation We were really uncertain about how we’d go with our regulator as we’d heard stories that they could be difficult to deal with. Also, many said we were crazy and they’d never approve a butcher’s shop on a farm. As there are other butcher’s shops on farms, that’s clearly not true… and now we’re here as another example! That is, wooden blocks are legal, and simply must be kept in good condition. If you want more insight into how to build something legal, we found it very worthwhile to join the Australian Meat Industry Council (AMIC). They not only have been great at providing advice and making visits to check out our facility before the inspectors came, your membership fee pays your year’s audit fees, so is a great value proposition. Butchering qualifications There is no legal requirement to have a certificate to be a butcher. But there is very good reason to ensure you are trained by one! Butchering is hard, skilled work, and should be approached seriously as such. I apprenticed informally with our butcher for six months, butchering between two and four pigs per fortnight over that period. It was invaluable, and I’d strongly recommend you do similarly if you can find someone as accommodating as Sal was. Budget & Actuals I’ll finish with our budget, target and actuals. As with most things at Jonai Farms & Meatsmiths, we buy secondhand materials as often as possible. Virtually everything in the butcher’s shop is secondhand (excepting the bandsaw, MGO & expoxy flooring, and my beautiful red gum butcher’s block made by our mate Turk). So while we budgeted for possibly having to pay the price of new equipment, we typically found secondhand due to Stuart’s excellent commitment to spend time trawling the internet & back laneways for others’ disused or discarded items. That’s why the ‘target’ column is lower than the ‘budget’. Note that the actuals column includes items we hadn’t foreseen, and yet we still came in under budget (*high fives to Stuart*). At the bottom we’ve costed in how much we think labour would have cost if Stuart hadn’t done it all himself – based on paying a qualified builder full time for one month to do the full conversion. Happy to take feedback on whether we’ve got that right or not. The work and cost involved in taking control of our supply chain has had enormous benefits to us, which we sum up as an ‘ethically viable no-growth model’. Most importantly, we can provide total transparency to our customers (e.g. there’s really no gluten in any of our sausages, just meat, fat, salt, pepper, spices & herbs from the garden! ), and can respond flexibly to their orders just like a regular butcher’s shop, instead of being locked into particular sized cuts, number of chops per package, etc. We also have control of the reliability of our butchering – only we can let ourselves down if we can’t cut for some reason. This is an enormous relief as most small producers will attest. We don’t need to grow our herd to make ends meet – we’re fully viable at a size that respects what Salatin calls the ‘ecological umbilical’. We have no need (let alone desire, but who does?) to tax our land beyond its capacity. We hope this information is all useful to lots of other passionate fair food farmers out there! We take Joel Salatin’s advice to ‘hold your innovations lightly’ very seriously, and intend to keep sharing what works (and what doesn’t!). If you’re keen for more information, we now offer producers’ workshops on our ethically viable no-growth model, which we’re keeping intentionally affordable as we are here to help grow this movement, not just our own wallets. The next one is on 16 August 2014 and right now has plenty of room, but the last one filled up so don’t leave it too late to book. Our next step in taking control of that chain and making more delicious things for our wonderful community is to build a curing room and commercial kitchen, where we’ll be able to cure salami, prosciutto, coppa, and pancetta, and cook a range of charcuterie such as rillettes, pate de tete, and other things that make the most of the rich potential of the pig. You can check out our latest crowdfunding campaign to do just that over on Pozible, where we’re asking people to let us feed you instead of the banks!